Do Martial Arts Really Work? Martial arts is respected and feared by many as a way to calm the mind, have self-control, and defend yourself if attacked. Even black belts are required to inform a potential attacker of their skill level as a way to give them fair warning not to attack. But do they really work at winning a fight or protecting yourself from a violent situation? Many martial arts originate from Asian cultures. Japan is famous for karate and judo, Korea has Tae Kwon Do and Hapkido, and China has Kung fu. It is a commonly held belief that most Asians know some form of martial art, but this is easily debunked by taking a trip to an Asian nation. The claim is that these ancient practices help calm the mind, promote a feeling of self control, provide self confidence, and also come in handy in case anyone wants to fight you. Many of the forms do not require the student to be very big, as they use their opponent’s size and weight against them by employing leverage and maneuvers to thrown them off balance. This means that these are accessible to anyone that wants to learn them, regardless of current size or ability. Martial arts find their way into 8 out of 10 movies that come out of Hollywood. Action heros always seem to know at least some form of martial arts, and some films make their entire story about it. Kung Fu Panda one that prominently featured kung fu, while the first Matrix movie showcased a jujitsu battle between Neo and Morpheus. In addition to that many of us grew up with Karate Kid and its sequels, as well as The Teenage Mutant Ninja Turtles and Mortal Kombat. Video games are another outlet that showcases the different forms of martial arts, including the aforementioned Mortal Kombat, as well as other games like Street Fighter and Tekken. There just seems to be no end to people’s infatuation with martial arts, and we’ll consume just about anything that has it in there. The cost to learn martial arts varies from free, to hundreds of dollars per month. It’s all about how you decide to learn, and from whom. There are YouTube videos you can watch for free that will show you the basics if you just want to learn enough not to get pummeled in a fight. Or you can learn from certified black belts in private lessons or in classes. It’s really just about you and your desire to learn. If you want to become a black belt and get very proficient in a martial art, you will need to dedicate yourself to daily training for several hours a day until you reach your goal. In many of the forms there is really no limit to how much you can learn. A black belt is just the start of your training, as you can move up the Dans and learn from a Dan master. Once you reach the first level you can study from a 2nd Dan on up until you are the 7th or 10th Dan depending on which type you’re in. Just because something has survived for thousands of years, doesn’t mean it does what it says it does. There are several fighting guides out there that make a strong case against martial arts as a form of self defense. They say that because of the complexity of most of the moves, you don’t stand a chance in a real fight because your adrenaline rush will force you to draw a blank and before you can get started on a move you will get smashed in the head. It seems that with the uprising of Mixed Martial Arts (MMA) a lot of the grace and art has been stripped away and it’s just about beating your opponent to a pulp. Also, many of these matches end up on the ground, and favor those fighters that have grappling knowledge, or can force their opponent to submit using a choke hold or an arm bar. Karate was well-known even before Mr. Miyaki and Daniel-san made it mega-popular. It relies heavily on strikes, both with your first and with your legs. knees and elbows. It is responsible for the popularizing of such terms as “dojo” and “sensei” from the Japanese language. It’s one of the more ancient martial arts, being at least hundreds of years old, with its exact origins obscured by the past. It did not receive enough votes to be entered into the Olympics, but nonetheless it remains popular with many kids around the world as a way to improve their performance in school, to let out pent up energy or aggression, and to teach better self-control and discipline. In regards to being a form of self-defense, a black belt in karate would have a much better chance in a fight than someone with no ability would. The basic premise of Judo is that you don’t throw a punches, but instead use your opponents attack as the driving force. You get them to make the mistake of attacking you, and you use their own momentum, size, and weight against them with simple chokes or throws that use leverage so you don’t have to lift them with your strength. In an actual fight it’s not really clear if you’d be able to side-step an opponent and be able to get close enough to them to apply a hold, or get in the perfect position to toss them around. Bruce Lee is a legend when it comes to kung fu and is almost single-handedly responsible for its popularity in today’s society. Jackie Chan is also a big name in kung fu, and between the two of them, there are dozens of films and footage documented their abilities and some of the more complex moves of the form. It is really an amalgamation of the different fighting styles throughout China, and originally came about as a necessity for self defense. These days you don’t see too many people learning it in America, but it is still very popular in China and other Asian nations. The question of whether or not it works is a valid one, because the moves look so complicated and choreographed that it doesn’t’ seem possible that a gang of bad guys would wait patiently in a circle while one kung fu master dismantles opponent after opponent. In a real fight would it be possible to use kung fu punches or kicks? Probably not, unless you’re a certified master in it. Trying to replicate what you saw in a badly dubbed kung fu movie will probably get you hurt. Many Korean children end up taking at least beginner Taekwondo lessons, and many that don’t come up to your elbows will gladly sport their black belts. It’s one of the national staples there, and it has a lot of similarity to karate in Japan. It relies mostly on kicking and punching, but it also stresses a lot of aerial moves, like jump kicks and along with Judo is an Olympic sport. It definitely has some good techniques in it, and since they’re not very complicated you would probably be able to bust them out in a fight and defend yourself pretty well. Another popular martial art in Korea is Hapkido which also includes joint locks and weapons, making it more useful in a real fight. It’s hard to deny that martial arts still hold a place of reverence for many. There is still a bit of mysticism about them, as if they are an ancient form of combat passed down by the generations. Whether that’s from all of the movies that keep this feeling alive, or because they’ve earned the reputation, many people still find them relevant in today’s society. If you want to learn a martial art in order to relieve stress, and find some inner peace, they can be a great way to bring you into the present moment. They are also a fantastic way to burn calories, work the core, and build lean muscle. If you are looking at it more as a way of defending yourself, you might want to look into more effective ways that can be learned in less time. What do you think? Do Martial Arts work or not? Does Airborne Work to Help Boost Your Immune System? Does Light Relief Really Soothe Aches and Pains? Does City Lips Really Work? I studied Tang Soo Do for about three years as a teenager. I never had the occasion to use it in a real fight. That may be just as well. Much that we were taught would look impressive in a staged demonstration. It would probably be less effective in a real fight. One problem was that it made too many assumptions about what an opponent would do. Another problem is that we would pull our punches and kicks short of the target. This has two shortcomings. First, it does not build the power you need to make a technique effective. It is not enough to hit a man’s jaw. You need to hit him hard enough to knock him out, stun him, or at least make him want to stop fighting. Also, pulling punches and kicks can become a habit that is difficult to break in the stress of a real fight. I have heard of karate students who pulled their punches and kicks in real fights. Their opponents did not. The results were not good. Free sparing matches are contests between two or more karate students. Free sparing teaches one to respond to unexpected offenses by one’s opponent. Unfortunately, punches and kicks are still pulled short of the target. Since the 1970’s protective equipment has been invented for full contact sparing. Unfortunately, most karate studios do not use it. Gichin Funakoshi was an Okinawan karate instructor who introduced what had been a secretive Okinawan art to Japan proper in 1922. 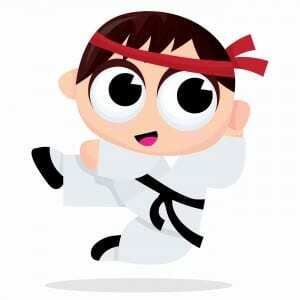 He said, “Kata is the heart and soul of karate.” Kata consists of series of pre arranged punches, kicks, and blocks. These fail to develop the power to make a technique effective. They fail to train one to respond quickly to unexpected situations. Some of the techniques are impractical. For example, in one technique one blocks a kick by crossing his arms and bending forward. There are two problems with this. First, it takes too much time. Second, if you bend forward you expose your face to a kick or a punch.I have enough respect for tradition to believe that there is some value in the traditional katas. Kata should not be the central element of your training, however. It can be useful if you are traveling, and lack anyone to train with. Some people say karate training improves one’s character. This is only true if you have an admirable instructor, as I fortunately did. An admirable instructor can improve character by teaching an academic subject. If you are serious about learning how to fight, go to a studio where the emphasis is on full contact sparing with protective equipment, physical conditioning, and punching and kicking a heavy boxing bag. Boxing training builds power. Nevertheless, a boxer is not trained to block kicks.